Australia and New Zealand celebrate ANZAC day on 25 April, the downunder equivalent of Armistice Day, 11 November, in Great Britain. Why ANZAC and why 25 April? ANZAC is the abbreviation for the Australian New Zealand Army Corps, formed in Egypt from the First AIF (Australian Imperial Force) and the First NZEF (New Zealand Expeditionary Force). Before the First World War (1914-1918), Australians and New Zealanders had fought together in many conflicts, not as ANZACs, but as members of the British Imperial Army. These included the Maori Wars of 1840 to the Second Anglo-South African War of 1900 and about ten other major military actions. In 1911 all New Zealand males from the age of 12 were required to undergo military training. With the outbreak of the First World War in 1914, most of the volunteers for the 1st NZEF came from this territorial force, which explains, incidentally, why so many underage soldiers volunteered - and many fought. The first NZEF was made up of two brigades: one of infantry and a second of mounted troops. This contingent sailed for Australia within two months of the declaration of war and joined the 1st AIF to travel in convoy to Egypt to where the force was diverted for training before heading for the Western Front. The Imperial Army first intended to name the combined contingent from downunder the Australasian Army Corps, but fierce protests from the New Zealand component led to the Australian and New Zealand Army Corps. The administration clerks found the title too cumbersome, which led to the ANZAC abbreviation finding favour with the troops and entering the language as common usage. ANZAC was also the ideal codename for the combined force. Never has so united a force impressed itself so indelibly on the collective mind of two nations, a welding a fact and purpose that began with the Gallipoli Campaign on 25th April 1915, also known as the Dardanelles Campaign, which was as disastrous an enterprise as ever conceived in the mind of a war lord whose identity in this instance is unnecessary. Jim Dove (c1941) at Saunton Sands, North Devon - to where the school was evacuated during WWII. Landed at Gallipoli, in the wrong place as it turned out, the Australian contingent of the ANZAC force fought through a murderous fire to clear the way for the Kiwis to land and, together, the combined force reached the heights only to be driven back by superior forces, but not the beaches on which they had landed. The ANZACs then dug in under constant fire and there they remained, never to be driven from their trenches. On 19th May at the Battle of ANZAC, the 17,000 ANZACs withstood a force of 40,000 Turks. At the Nek, the Turks breached the Kiwi lines and streamed through, but the New Zealanders rallied, fixed bayonets and forced the Turks back to their own trenches. Only at Courtney did the Turks succeed in capturing an Australian trench, but in an incredible act of heroism that earned him a VC, Albert Jacka from Winchelsea, Victoria, recaptured the trench. sons James and John. 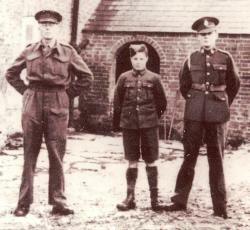 John Dove was on boy service in the Royal Signals. Jim Dove (Wn 1941-1945), joined the Duke of York's at Saunton and was one of the few Dukies who never saw the Dukie premises as a student. He served with the Royal Signals from 1948 to 1953 and then with the RNZ Signals from 1954 to 1969 after which he worked for Air New Zealand in communications and flight operations from 1969 to 1990, then moved to Australia and remarried, his first wife having died in 1989. In fact, Jim Dove is one among hundreds of NZ Veterans living in Australia who turn out every ANZAC Day to share the occasion with their Aussie comrades. For ANZAC Day, 2010, Jim was invited via the NZ High Commission to lay a wreath at Kempsey, NSW, and to make an address as a member of the NZ Veterans Association. He chose as the theme of his address the part New Zealand played in the original ANZAC force because it was the first time the NZ Veterans Association had been asked for a representative to address a parade outside Sydney. Jim spoke of the Gallipoli Campaign during which the Kiwis and Aussies were welded into a first-rate fighting force, of their common distain for British class differences (neither soldier being particularly fond of saluting unless the officer concerned had their respect), and their fierce rugby contests in which no quarter was asked nor given. By local accounts of the occasion, Jim's address on the origin of the ANZACs was well received. It had the right amount of information without being maudlin as so many such speeches are, and kept the attention of the crowd with information of interest to young and old alike. He noted that at Gallipoli 2721 Kiwis were killed and 4753 wounded out of a total force of 8450 men. That was an 88 per cent casualty rate, for the population of New Zealand at that time was a little under one million. Jim Dove is to be congratulated for stepping into the breach to represent the NZ Veterans Association on ANZAC Day, which is celebrated with equal intensity in both Australia and New Zealand.